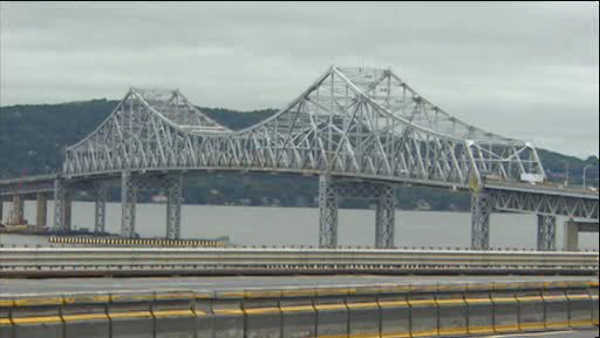 NYACK, New York (WABC) -- Cashless tolls took effect at the Tappan Zee Bridge shortly after the stroke of midnight Sunday. The new system of electronic toll collection allows drivers to pay their tolls without slowing down or stopping. They can pay either by EZPass or tolls by mail. The Tarrytown toll plaza is being deactivated as the cashless tolling system in South Nyack goes live. The new system was developed in conjunction with the New NY Bridge project, which is under construction and will replace the Tappan Zee Bridge. "The New NY Bridge is being built to last more than 100 years without requiring major maintenance and will feature state-of-the-art technology," said New York State Thruway Authority Interim Executive Director and Chief Operating Officer Maria Lehman, P.E. "Cashless tolling builds on those advancements by making it safer and more convenient for drivers to pay their tolls. This technology, which is being used on many roads and bridges around the nation, will also ease highway congestion and help the environment by reducing idling." The Tappan Zee Bridge carries the New York State Thruway (I-87/I-287) over the Hudson River and connects Rockland and Westchester counties. Convenience and improved traffic flow are among the major advantages of cashless tolling, the Thruway Authority said. It also eliminates the need for vehicles to weave in and out of toll lanes, thus reducing the risk of accidents and delays. Those with E-ZPass will experience no change in the way they pay their tolls. Tolls By Mail will be used to collect payment from those without E-ZPass. High-resolution cameras above each lane at the cashless tolling gantry will take a photograph of the vehicle's front and rear license plate to register the transaction. A toll bill will automatically be sent each month to the vehicle's registered owner by U.S. Mail. Once the system is activated, drivers can pay online at the Tolls By Mail website; by mail; over the phone; or in-person. They can pay by check, credit card, checking account or cash. Motorists will also be able to text **826 to quickly receive information about the Tolls By Mail website and payment details. Approximately 25 million toll-paying trips were taken over the Tappan Zee Bridge in 2015.